Part of the show Flu Vaccines from Tobacco? Chris - the more that we learn about Neanderthals, the more fascinating they seem to become. Much of our understanding comes from a remarkable site on the south coast of Jersey called La Coq, St Brelade. Here, archaeologists have found piles of butchered bones suggesting that animals were literally driven over cliffs to kill them. Planet Earth Podcast presenter Richard Hollingham has been to see it. Richard - Now I'm just clambering over the rocks and it's a spectacular landscape. Over to my right it's almost a white long sandy beach that runs right across the bay out to the headland and then behind me these enormous granite cliffs, almost like towers coming out straight from the rocky shoreline, and Matt Pope is here from University College, London. Now, Matt, this is world class really. Matt - Yes, this is one of a very limited number of sites in the prehistoric world that document long term occupations by ancient humans. It's part of a wider pattern that we see over the world sometime after 600,000 years ago where humans start on a long term basis to colonise fixed places in landscapes and usually that means caves. Richard - Now we're looking out over the English Channel under very heavy cloud today. Now if we go back, I don't know, 60,000 years, 100,000 years this wouldn't have been water here. Matt - No, if we're going back into the last ice age into the Devension, the sea level would have been much lower and what we would have been looking at is not a flat featureless plain, but a landscape of granite bluffs, steep sided granite ravines all feeding into a river valley system that ultimately feeds into the large English Channel river that would have run down the middle of the land under the sea today. Richard - The caves can only be reached at low tide and even then it's a difficult scramble across the rocks. At the top, Matt and his colleagues are scraping away at the ground with small archaeologists trowels. Martin - My name is Dr Martin Bates. I'm from the University of Wales, Trinity St. David in Lampeter and I'm a geoarchaeologist. Richard - So what is this we're looking at? It looks just like a piece of flint. Martin - It's a piece of flint that has been chipped off a core. That flat surface on the top there is where somebody has hit down there is it's broken off. Richard - So this is only about the size of your thumb nail, here Martin. And how do you know it's not just a little bit of flint? How do you know that's been made? Karen - My name is Karen Rubens and I'm a PhD student at the University of Southampton. 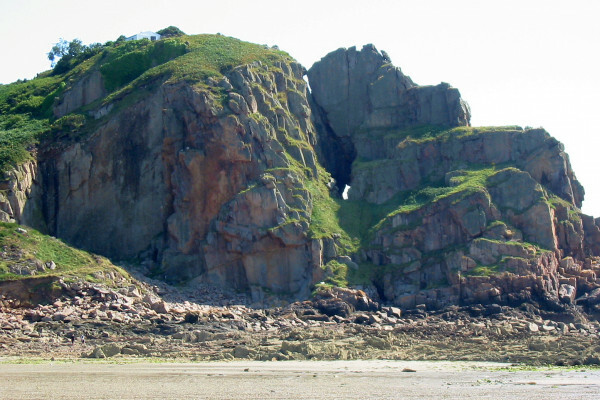 La Cotte a St Brélade is a site that everybody learns about as an undergraduate, everybody knows it, it's such an important site for mega fauna hunting. The story that the Neanderthals used to drive mammoths over the cliff here and they have huge bone heaps under the arch. If you come here and you have to walk on the beach, on those pebbles, you have to climb around then you come around the corner and you can see the scale of it and the massive amount of sediment and rubble that is still here. It's very impressive and it's very difficult to describe because even if you see pictures you can't imagine the scale. Matt - Of course the thing that is really captivating about the sites are the piles of fauna, piles of mammoth and piles of butchered rhinoceros and trying to envisage what the site was like then. Now we're pretty sure it was still enclosed, or at least partially enclosed, at that stage and also the site would have been much fuller and so, you're within a cave environment with a solid roof, they're bringing, we think, in these elements of mammoth skull, mammoth ribs into the site and they're carrying out knapping there. We also know that there's ash and burnt bone as well. So, at this stage if you're imaging it, we're in a very cold environment, we know there's a lot of ice flowing around, so it's quite arid, sea levels are very low. They found an area of shelter here that they're using for the sharing of meat, for the butchering of animals and for making flint tools and also burning material, potentially bone. Richard - Just being here and just talking to the three of you, you could sense the excitement and you're finding things. You've been here between the tides, three hours or so and yet you've found a couple of pieces of flint, you've just found a little tooth, you know, it's exciting stuff. Matt - Well it's an incredibly rich site and that's why our excitement, we hope, can now translate into preserving it for future generations and that's going to take a lot of work and this is just the first stage in stabilising the site and working with the site owners to affect a long term preservation solution here. Previous Malaria Vaccines, Looking but Seeing and Nanoscale Electric Cars!